I remedied the enormous forearm problem in today’s portrait. The most important feature in the sketch below is the delicate positioning of the young lady’s hand. Therefore, the forearm-to-upperarm ration is consequential. I’m having second thoughts about the title of this sketch. The subject’s pose does not suggest that she is leaning very hard on her bent wrist. Perhaps she’s not concentrating very hard. If I were deep in concentration my hands would be holding the whole weight of my head. So instead of concentrating maybe she has a headache, or is reminiscing or day dreaming. 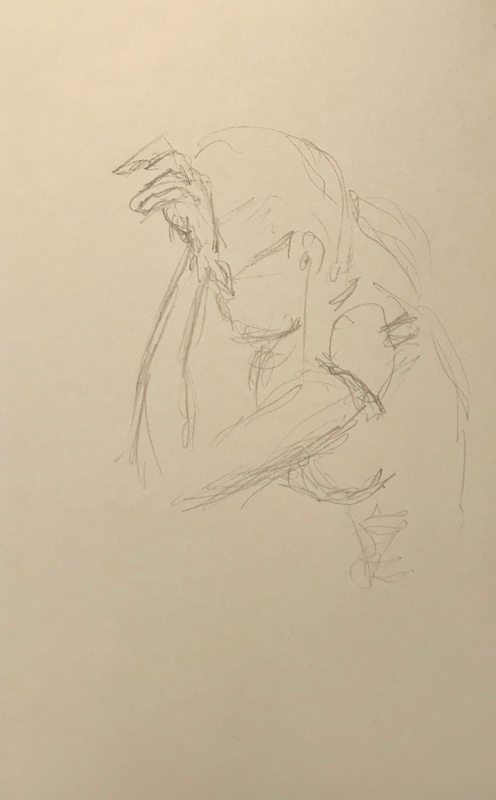 This entry was posted in Personal Stories and tagged art, artistic process, creativity, drawing, gesture, pencil sketch, portrait, pose, sketch, visual art. Bookmark the permalink. I like this a lot. I think her pose is, she is thinking but it’s not occupying her whole mind, and she is restless. Quite a story for just a gesture. It’s great that you captured that, I think. Yes, if you can capture a gesture it’s half the battle. You do that in your writing. Thank you. I think it’s those unguarded moments with just the little details, that tell the whole story, and there is always a story, if you look. I think drawing really focuses that observation process in a way that is rewarding in results (the drawing) and in the process of doing it. ‘Unguarded moments’ perfectly describes an important element that a good portraitist should strive to capture. Thank you, Claudia.